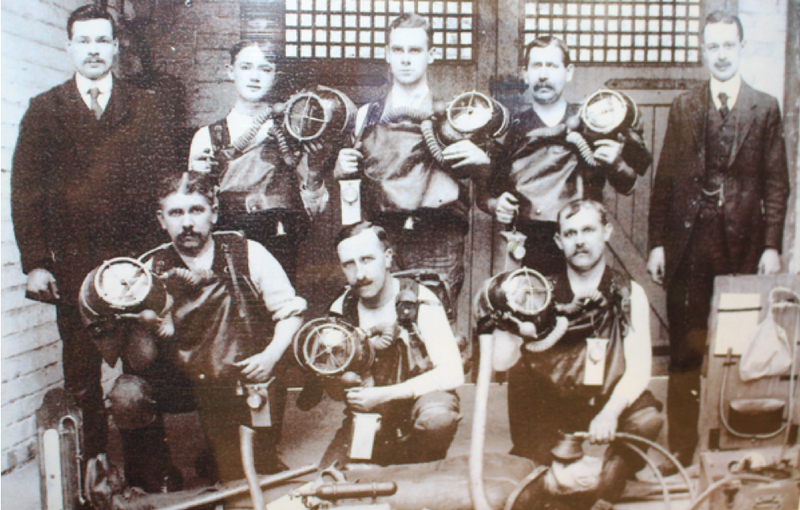 Dinas Mine Rescue Service c.1912. On a recent trip to Merthyr Tydfil Library, I was searching through several large boxes of uncatalogued photographs, newspaper articles, and photocopies of handwritten notes when I discovered the image of a mine rescue team above. There were no annotations on the back of the photograph to give any clue as to the names of the men, the date of the photograph, or even where it was taken. However, from the hair (and moustache!) style of the subjects, I estimated that the picture was probably taken circa 1910. This was an exciting discovery. Although mining disasters had sadly long been commonplace, any serious rescue and recovery efforts only became possible after Johann Heinrich Dräger and his son Bernhard invented valves that allowed the successful removal of carbon dioxide and the regulation of oxygen flow in tanks in the closing decades of the nineteenth century. Therefore, the equipment in this photograph must have been among the very earliest available[i]. Some online detective work led me to Andrew Watson at MRS Training and Rescue (formerly Mines Rescue Service), who confirmed that the equipment in the picture was the 1904 Dräger model which had been used by rescuers in the Courrières mining disaster in 1906, saving many lives. Astoundingly, despite the small amount of background shown in the picture, Andrew also managed to tell me where the photograph was taken; the Dinas Mine Rescue Station, some 16 miles south of Merthyr Tydfil. The station was opened by King George V and Queen Mary in June 1912, and I suggest that this picture is most likely from around this date. One last mystery remains: who were the men in the photograph? Or perhaps more accurately, who were the men and boys in the photograph? While none of the men are old, the two figures in the top left corner, particularly the one on the left, cannot be any older than their mid-teens. It is unlikely that we will ever discover the identity of any of the men (although if you recognise anyone, please do get in touch), but the harrowing accounts of miners and mine rescue workers from the early 1900s shows that serving in the Mines Rescue Service must have required an extraordinary amount of bravery, and one can only imagine the horrors they faced, even with cutting-edge breathing apparatus. With thanks to Mary Oates at Merthyr Tydfil Library and Andrew Watson at MRS Training & Rescue.